1990 called and Buttons, Flair Pins, Patches… they are making their way back on trend like you couldn’t imagine! They are fun to collect and wear on your purse, a tote bag or even clothing. But what happens when you aren’t wearing them? They are small enough that they can easily get lost and so they sit typically in a bowl or dish… and then you never see them again. Not anymore! I’ve partnered today with the raddest company, Social Print Studio to share my easy DIY Button Display Holder. I have been a huge fan of Social Print Studio since the beginning… back when they were Printstagram. They have the coolest mini print books (we have like 6 of them full of pictures from when my kids were little babes), stickers and magnets. Not to mention tons of cool larger scaled prints. I really love this company and if you sign up for their newsletter or email list, you will be in for a treat. It’s a comical treat every time – trust me. Plus, they just released a referral “give $5, get $5” program. You can get a referral code by making an account on their site. You can get a referral code by signing up here. Any new customers who use your code will get $5 off their order and you’ll get $5 in credit! Woot woot. Also now available – Paint Palette No. 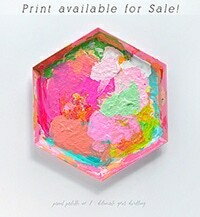 1 Photography Print of my paint palette pictured below!! First, measure the inside dimensions of your wooden box and cut three strips of cork board accordingly. You can make them strips as wide or narrow as you like. Then, paint the outside edge of the box a bright fun color. I went with a lime green/yellow color. While the paint is drying, cut a piece of scrapbook paper down to size and glue it inside the box lip. I painted just the edges of my cork a matching blue color to the scrapbook paper because… I just can’t leave things alone and love little details like that. Last, secure the cork board strips to the inside of your box using a glue gun. These are just a few of the fun buttons I ordered from Social Print Studio. They turned out so great, I have loved being able to use them! And to secure them onto the cork, you simply open the back of the button and the pin slips right into the cork! No more losing your buttons when they aren’t being used and they are on a colorful display! The buttons come in a set of 15 and I ordered simple images from my Instagram, but how fun would it be to order your family’s faces or special vacation pictures! The options are endless! 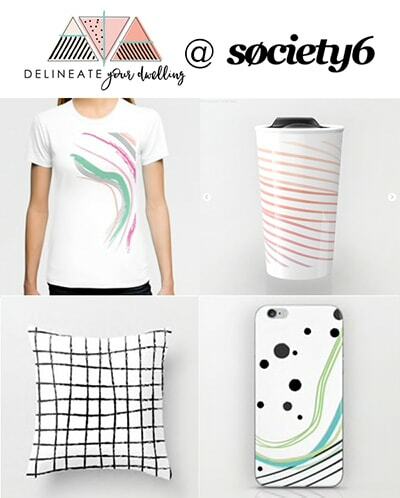 This post was in collaboration with Social Print Studio. They provided product, but all opinions were 100% mine. Believe me, they are super rad. The buttons are such a fun party favor idea, and I just love the holder that puts them out on display to enjoy! Thanks, Lindsay! I love the party favor idea!! This is such a great idea! Definitely going to make this for all of my Disney buttons! Ah, such a great idea for your buttons! Amy, this is so cute! I love the pattern and color, and the BUTTONS! Adorable!